I wanted to share a bio on Ellen Abdow, the smart and dynamic owner of Perennial Gardens, a landscape firm in Boston. She’ll share helpful gardening advice and will create a gorgeous container garden right before our eyes at the May 5th “Gardening Experts Speak! 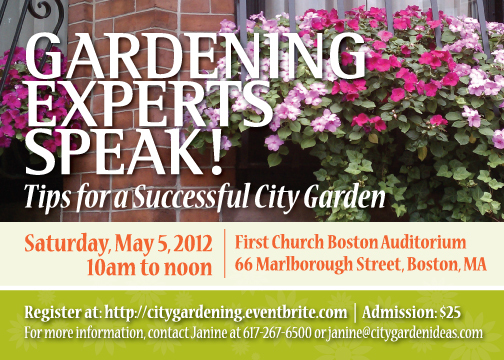 Tips for a Successful City Garden.” Come join us! Sign up today at citygardening.eventbrite.com. Ellen is the founder of Perennial Gardens, LLC, a landscape design and build firm with clients throughout New England. The firm has a diverse portfolio and Ellen and her expert team have cultivated a reputation for careful plant selection, imaginative composition and skilled installation. Ellen brings 18 years of knowledge to each and every project. She first got bitten by the gardening bug while teaching at Brookline High School and subsequently went to work at one of the area’s most respected nurseries. There she expanded her love and knowledge of perennials before launching her own firm. Today she gets great pleasure from helping clients hone their own personal garden visions and adapting these ideas in ways that will best suit their particular properties and lifestyles. Her work can be seen in numerous garden tours, on a walk through Boston’s Back Bay, or on line at perennialgardens.net. Come hear gardening wisdom from Ellen! Sign up today for the May 5th workshop! Register at citygardening.eventbrite.com. Cost is just $25. This entry was posted in City Garden Ideas Workshops, Classes, Expert Advice, Flowers and Plants, Lectures, Places to Visit, Window Boxes, Workshops and Seminars and tagged City Garden Ideas, City gardening, cold weather perennials, container gardens, Ellen Abdow, Expert Advice, Flower Design, Gardening Workshop, Small space gardening, urban gardening, Window Boxes. Bookmark the permalink.